There exists a saying about high-level synthesis (and any new disruptive technology, I must add). Maybe you have heard it before reading these lines; as an ingredient to a pitch, on colleagues' coffee break, at a press conference or maybe you have found yourself thinking more-less of this: "When I become proficient with this XYZ HLS tool, I will be 10x more productive! I will be able to fast-forward this task, put a smile on my supervisor's face; earn a good deal of quality time too!" Well this reads as a dream-come-true, but is it reasonable to believe in it? Is it already possible, or will it become possible (as in "how soon is now?") Being an order of magnitude more productive; is this myth, legend or a factual thing? To add some data into the soup, let's examine the following figure. For these ten algorithms, ANSI C code is passed to HercuLeS HLS (http://www.nkavvadias.com/hercules/ ). At the end of the flow, other things apart, we get the synthesizable RTL VHDL for the given C code. 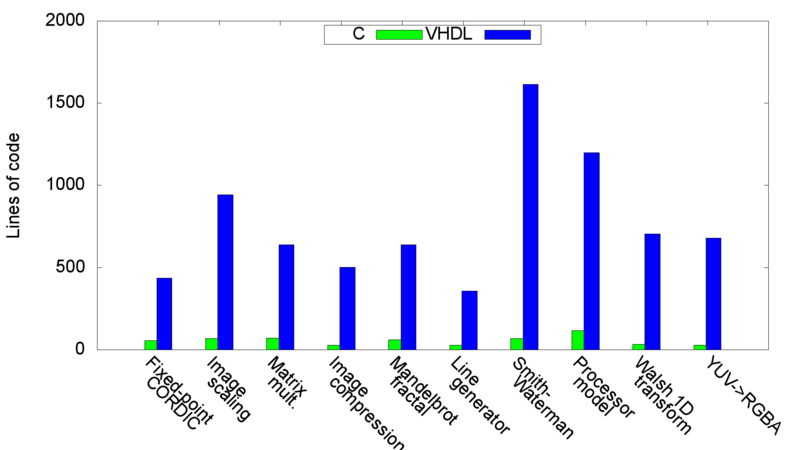 By measuring the VHDL-to-C ratio of useful lines of code (no comments etc), a 7.8x to 25.15x variation with an average of about 15 times (15.4x) is obtained. This is by no means conclusive but it is indicative. HercuLeS takes your code through a series of transformations; from C to N-Address Code (intermediate language) to graph-based representation (in Graphviz) to VHDL finally. Every step is from a higher abstraction level to a lower one and every step results in a more detailed representation as it moves from software to hardware (or HW/SW). Multiplicity in the number of generated RTL designs, as points in the architectural design space. These iterations are sloooow, so you have to keep them a) few, b) short. For this reason, they should not happen at the RTL, but rather at the level of an IL (intermediate language) estimator/profiler. Coding for parallelism, whether implicit or explicit, is challenging in the sense of near-optimal scaling for irregular applications and adequacy of the underlying hardware paradigm.